The ToughBuilt C300 Sawhorse and Jobsite Table is durable, rugged and offers unparalleled value. Constructed of 100% high-grade steel, this sawhorse has a remarkable 1100 lb. capacity alone, and 2200 lb. per pair. Compact and sturdy with fast-open legs, setup is straightforward and simple. Powder-coated and zinc-plated steel prevents corrosion and withstands rigorous environments. This folding sawhorse includes an easy carry handle for effortless transport and rolled edges for safety and comfort. These heavy-duty sawhorse brackets are perfect for professional carpenters, home improvement projects, hobbies and any other activity that requires a strong set of legs to hold up materials. You can even use them to make a temporary table at the next family gathering. Made from galvanized steel and hinged for speedy setup and disassembly, these practical sawhorse brackets are great for a variety of uses at home or on the job site. Milwaukee Hyperwire wire brush products offer faster material removal and greater life, yet maintain a finer finish. These cup brushes are ideally suited for cleaning castings, structural steel and sheet metal. The Milwaukee 16-Piece Bi-Metal Hole Dozer Hole Saw Kit comes with 9 hole saw sizes, 3/4 -Inch, 7/8 -Inch, 1-1/8,-Inch 1-3/8 -Inch, 1-1/2 -Inch, 2 -Inch, 2-1/8 -Inch, 2-1/4 -Inch and 2-1/2 -Inch Features Rip Guard teeth, built with more steel for added strength. These teeth give increased productivity on the job site as well as better hole quality and are backed by a limited lifetime tooth break warranty. Each Hole Dozer is coated with a low friction; thermoset paint coating that provides faster cutting speed in wood and more holes cut per battery charge. The Hole Dozer comes with Plug Jack, an all-access slot design that allows for full access during plug removal. The Plug Jack enables access lower into the cup for thick material and higher toward the teeth for thin material, eliminating wasted downtime between holes. C300 Sawhorse The ToughBuilt C300 Sawhorse and Jobsite Table is durable, rugged and offers unparalleled value. Constructed of 100% high-grade steel, this sawhorse has a remarkable 1100 lb. capacity alone, and 2200 lb. per pair. Compact and sturdy with fast-open legs, setup is straightforward and simple. Powder-coated and zinc-plated steel prevents corrosion and withstands rigorous environments. This folding sawhorse includes an easy carry handle for effortless transport and rolled edges for safety and comfort. C300 Sawhorse is rated 4.7 out of 5 by 19. Rated 3 out of 5 by Rich from Good but should have some rubber on the feet. These... Good but should have some rubber on the feet. These are strong and handy but the feet are really sharp so when loaded, will dent/scratch the substrate that is being worked on. Rated 4 out of 5 by Gary from A little bit light but ok for the price.... A little bit light but ok for the price. Rated 5 out of 5 by Anonymous from Great product! Great Price Great product and the price was far better than anyone else! Rated 5 out of 5 by Replacement from Good prod Good product, compact, quiet (haha) and that pleasant orange color. Did just what its suppose to do...fold up! Rated 5 out of 5 by Lindalou from These are sturdy & substantial. The way the legs fold into the body of the sawhorse makes for eas... These are sturdy & substantial. The way the legs fold into the body of the sawhorse makes for easy storage and transportation. 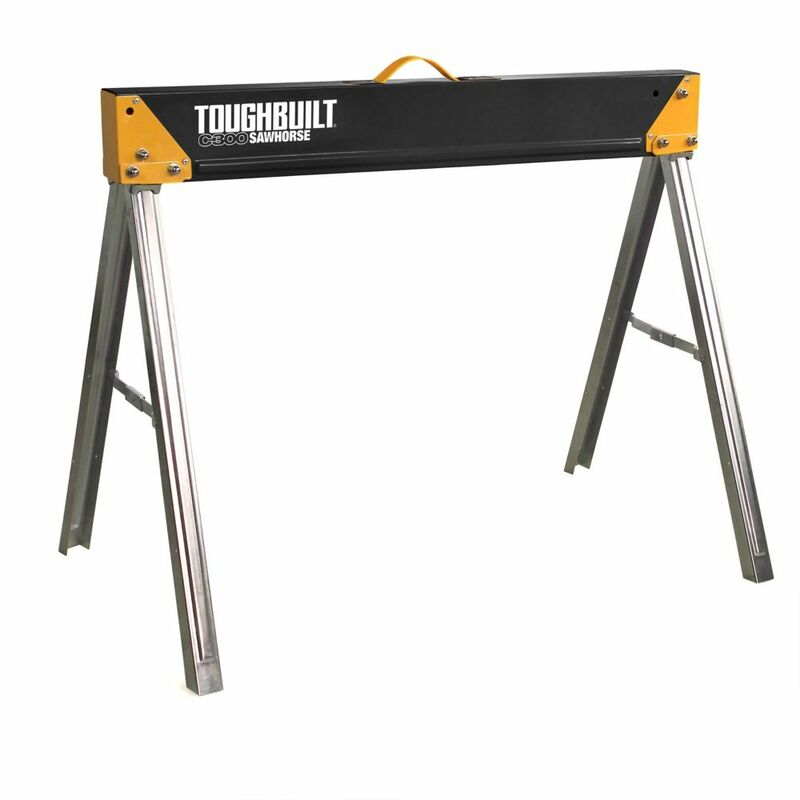 Rated 4 out of 5 by Anonymous from Toughbuilt sawhorses Great sawhorses for the price. Easy to set up and transport when needed. Carrying handles are great. Work great on hard surfaces , maybe not so good on soft surfaces due to leg base being small. Otherwise they work great for me. Rated 4 out of 5 by cron from Product came almost a week earlier than expected. So far so good. The sawhorses are sturdy, a g... Product came almost a week earlier than expected. So far so good. The sawhorses are sturdy, a good height, and can easily hold weight. Great product for the price.